-The tree is up with white lights. Ornaments to come, due to Johnny's institution of a Postmillennial Advent in our home. I'll let him blog about that, but I do share his hopeful eschatology. It helps to be wed to a great teacher. 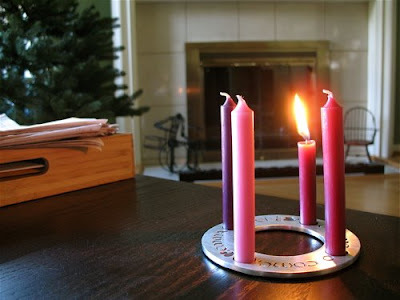 -Praying through an Advent liturgy with my husband. We are both pretty busy this week work-wise (and otherwise), but I'm thankful we made the time to remember our focus of the next few weeks (and always). The worship is important enough, obviously, but it's also good for my psyche as one who tends to stress out this time of year. -The Psalms and Isaiah. I can't get enough. -Downe in Yon Forrest by Kemper Crabb. I can't get enough of this music, either, so I'm writing about it for The Curator, to publish next week. -Johnny made bison chili in the Crock Pot. I am really into all kinds of chili lately. Next up is my friend's pumpkin chili recipe (with ground turkey). -A new Eighth Day Books catalog in the mail yesterday. I cannot recommend this bookstore or their 171-page catalog enough - the reviews are so well-written. -I'm in love with fruit. I missed it terribly this past year and a half. A Granny Smith apple + almond butter snack tasted like dessert, and I'm not exaggerating. A half grapefruit with breakfast made me very happy, too. -Planning to have merlot and dark chocolate on Sundays during Advent (a brilliant tip from Kate). -I think it's time to pull out Sufjan Stevens' Songs for Christmas box set. We listen to "Songs for Christmas" all year round. But don't tell. I absolutely love that photo of the candle. I want to celebrate advent. Can you point me in the right direction to start this year? i really like your candle set. i've been on the hunt for a couple of years now and this has been the one i like most. and i am off in a few minutes to buy our advent wine and chocolate! Sufjan's Christmas music is fantastic. Lo How a Rose E'er Blooming is my fave. Abbie, that is a great song. I'm listening to his holy-day tunes right now, in fact.